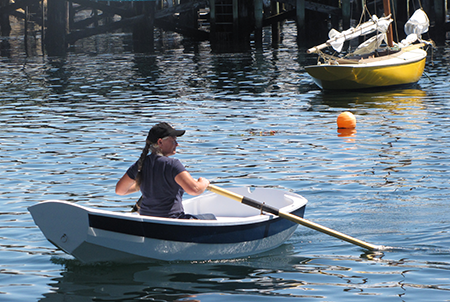 Our Nutshell Pram is a strong but light weight rowing dinghy that’s popular as a sailboat and cruising yacht tender but equally fun to row in a sheltered cove or lake. It can even be outfitted with a simple sail. Built with solid plank and extra frames, these prams are more robust than the more common plywood versions. Measuring just 7 feet, 7 inches in length, and weighing just 120 lbs., they're also very easy to maneouver both on the water or up on the beach.